The University of Western Australia is Perth's leading research university. The main campus is set against the Swan River's northern bank. The University of Western Australia (UWA) is a prestigious research institution that provides a relaxed environment for university study. UWA is located in Perth, a city of 2 million people on Australia's sparsely populated west coast. UWA is Perth's highest profile university and attracts many of the brightest students from Perth and surrounding areas. Although the main campus is only a short drive from Perth city centre, it provides a serene setting for the university's students and researchers. UWA manages to combine space with city living. The Crawley campus overlooks the blue waters of the Swan River, which leads to the Indian Ocean. To the north-east is Kings Park – a mixture of grassed parkland, botanical gardens and natural bushland (covering a greater area than New York's Central Park). West and north of the campus are low density suburbs that are occasionally broken up by sports and recreation fields. While offering space, UWA is no more than around a 10-minute drive or bus ride from Perth's CBD (which is on the other side of King's Park). 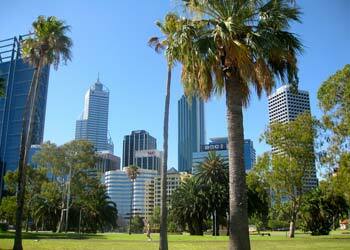 Perth city centre is the cultural and economic hub of Australia's 4th largest city. The campus itself is full of intellectual activity. UWA is ranked among the top 100 research universities in the world. Students have the opportunity to interact with world-class researchers and a large student community. Students of UWA typically live in private share housing in suburbs near the Crawley and Claremont campuses. Walking to and from classes is often a practical option for students living in Crawley, Nedlands, Claremont, Dalkeith, Shenton Park, Subiaco and Daglish. Perth's sunny and warm climate also means that commuting by bike or bus is generally a pleasant experience. Although Perth is a car-orientated city, due to being spread out, there are good public transport links in the city and student areas. Depending on the lifestyle you choose, studying at UWA can be expensive. Rental costs are high on average. But affordable options can be found, particularly if you are happy to share a house with 3+ other students. General living costs are also high, in part due to Perth's remoteness. However, if you prefer spending time outdoors, an abundance of sunshine, beaches and parkland makes Perth an inexpensive place to do fun things. Studying at UWA encourages students to live a balanced, active lifestyle. While academic pursuits are the main priority, the open, sunny environment draws people outdoors. Students may do sports, spend time in Kings Park or explore Western Australia's coast. The campus offers numerous sporting facilities and clubs (coordinated by UWA Sports). The Watersports Complex is home to the UWA Boat Club, Underwater Club, Waterski Club, Outdoor Club, swimming pools, tennis and squash courts, sports and leisure shop, and numerous sports clubs. Nearby is the UWA Sports Park, with 33 hectares of playing ﬁelds and facilities (including the UWA Tennis Complex, the largest clay court tennis complex in Australia). Campus social activities are organised through the UWA Student Guild. It puts on a fringe festival, campus band and DJ competition, provides many of the services and supports over 100 clubs and societies. The university is positioned a short drive from Perth's city centre and nightlife districts, including St George's Terrace and Northgate. UWA students often organise suburban house parties as an alternative to clubbing.